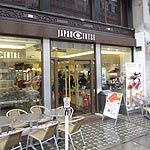 The Japan Centre offers a deli, a bakery and a fish and meat counter. Specialising in authentic Japanese food they also offer an extensive selection of sake. Do you work at Japan Centre? What did you think of Japan Centre? Been visiting Japan Centre for many years now, almost 10 years. The food quality had always been quite tasty, although a bit more expensive compared to others, mostly due to organic ingredients. However, for the past few months or so, I have been disappointed from quite a few occasions, mainly to do with a few impolite staffs behind the counter, and missing my BBQ pork in my take out ramen soup. Not to mention, twice I sat in the canteen restaurant having my ramen, the amount they give is terrible, ?6.50 for a very small portion of ramen is badly compared to other proper Japanese restaurant (much better value). I'm not sure if it's because of some new staff working there, but I haven't been disappointed for the past 9 years until now. I won't be eating in unless they offer more for the money, or at least more polite staff (only a few that is, most staffs are nice, especially one of the older short cheerful lady). Best sushi ever! Ive been going to the Japan centre for the last 3 years, its so cheap £2-£3.50 for most salmon based sushi and its so fresh. The new location on Regent Street has a much larger premises so bigger selection than the Picadilly shop. Tricky to get a space at the canteen style tables so normally take away. They also have a fabulous deli with noodle soups and tempura etc and a small supermarket.